The wristwatch itself is obviously the most important thing in any wristwatch photo. So just put it in the center of the frame, zoom in and click away. Well that's one way of doing it. An interesting background however, can make a photo much more attractive looking. 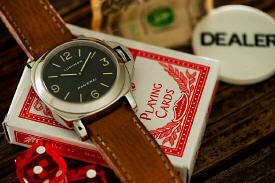 In terms of composition, putting a watch in the center of the frame generally doesn't work too well. But in combination with a background that contains other elements of interest, it doesn't seem to work well at all. So if it shouldn't be in the center then where should it be? There's an ages old composition rule, that painters in the golden era used already. 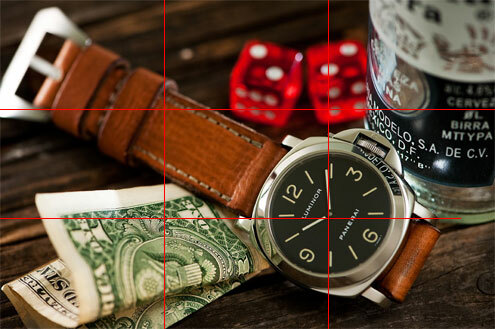 This is called "the rule of thirds" and it's often used by photographers too. 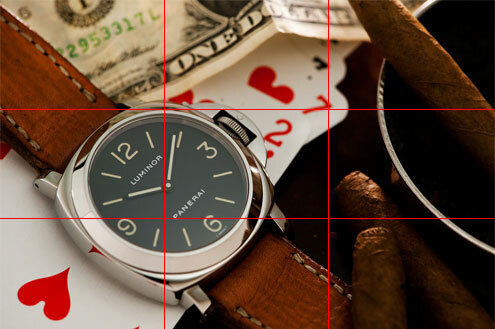 The "rule of thirds" is very simple. Divide the frame into nine equally sized parts by drawing imaginary lines. Two horizontal lines and two vertical lines (see above example). The main point of interest should be at the center of any point in the frame where the lines cross. It's as simple as that. Although an interesting background can result in a much nicer photograph, the background shouldn't be too obtrusive. A good photo has one main point of interest and the eyes should be automatically drawn to that point. That's where creative use of depth-of-field comes into play. As opposed to using a small aperture that would ensure that the entire scene is within the zone of sharpness, try to throw the background elements out of focus by using a wide aperture. If this aperture stuff is new to you, then you may want to read camera settings and depth-of-field first. If you look at the first photo you can see that the dice, the buckle and even the part of the one dollar bill that's closest to the lens, are all out of focus. The first photo was taken with an aperture of f5.6. With such a shallow depth of field, it's quite difficult to make sure that the most important part of the photo is sharp. 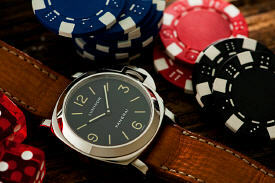 In this case the most important part is the dial of the Panerai 2A. The dial of the watch in the first photo is more or less perpendicular to the front of the lens. This way most of the dial is still within the zone of sharpness, even with an aperture of f5.6. In the second photo, the dial is more at an angle compared to the lens. You can see that the numbers three and nine on the dial is already slightly out of focus because of this. I could have used a smaller aperture for this photo to have all of the dial more in focus. Maybe half a stop or even a stop which would have been 6.7 (a half stop) or 8 (a full stop). But I didn't want the playing cards and the dollar bill to be too sharp. To wrap it up, here are a few more photos of this combo. And in case you're thinking yeah yeah, sure sure, but what's that strap... It's a Kevin/BigB ammo strap with a sewn in MX buckle. 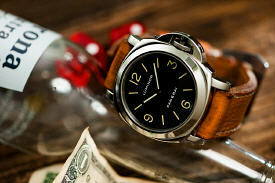 You can buy one here on watches24seven.com.